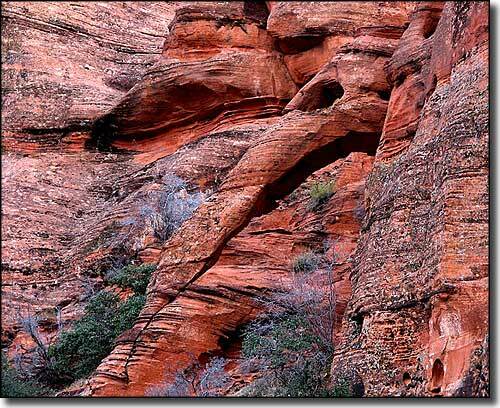 Red Cliffs National Conservation Area is comprised of about 62,000 acres of property that used to be managed as a Special Recreation Management Area (until the Omnibus Public Land Management Act of 2009 changed things). 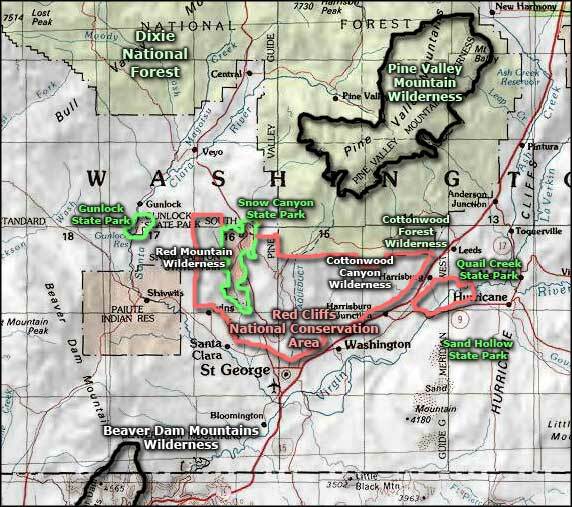 The property extends northwest and northeast from the city limits of St. George, wrapping around three sides of Snow Canyon State Park and extending eastward from there along the southern edge of Dixie National Forest. There is another non-contiguous section of the property that lies east of the I-15 and west of the town of Hurricane, north of Utah Highway 9. Established in 1996 under an agreement among various federal, state and local partners, the property includes a mix of public, municipal, state and private lands. 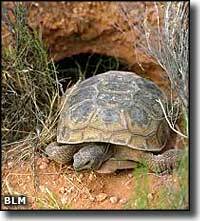 A key element in the creation of the Red Cliffs National Conservation Area was participation by the US Fish & Wildlife Service under certain provisions of the Endangered Species Act: the NCA is dedicated to the protection and recovery of rare species of wildlife (including the threatened Mojave desert tortoise) at risk because of natural environmental factors, disease and on-going urban encroachment from the St. George metropolitan area. Because of all the agreements in place that guarantee the safety of endangered animals and their habitat within the Reserve, more than 350,000 acres of private land that would have come under the edicts of the Endangered Species Act in the Washington County area were given a blanket permit by US Fish & Wildlife to allow their development as long as certain rules contained in those agreements were followed. Red Cliffs National Conservation Area sits at the merging point of the Mojave Desert, Colorado Plateau and Great Basin ecosystems. This is a biologically rich area with plants and animals living essentially side by side from each of those three life zones. Because of this "eco-juncture," you'll also find plants and animals here that occur nowhere else on Earth. This is a very fragile habitat and the rules for human use are many, and well enforced. There are several maintained hiking trails (motorized/mechanized vehicles are allowed on designated roads only) in the area but if hiking or mountain biking, you must remain on the marked trails: it's too easy for a moving human to cause irreparable damage to the vegetation and the cryptobiotic soil crusts, or to disrupt the natural trails developed and used by foraging animals. The landscape of the NCA has been divided into 2 somewhat distinct units: the Lowland Zone and the Upland Zone. The Lowland Zone tends to be much more fragile and more easily harmed than the less biologically sensitive and more durable Upland Zone. The Upland Zone allows hikers and horseback riders a little more freedom to responsibly travel cross-country. With some limitations, camping and campfires are also allowed in the Upland Zone. Camping is allowed in the Lowland Zone only in designated campgrounds, campfires are allowed only in established fire rings and travelers must stay on designated trails. The Cottonwood Canyon and Red Mountain Wilderness Areas are also within the boundaries of the Red Cliffs National Conservation Area. There are additional management restrictions in place on these properties, most notable of which are the rules against any kind of mechanized or motorized vehicles (including mountain bikes) on the property. Photo of Elephant Arch courtesy of Aaron D. Gifford, CCA ShareAlike 3.0 License.